SAN DIEGO – There were three big crashes in San Diego County overnight Wednesday, including a head-on wreck in Carmel Valley in which one driver was hurt and a second driver fled the scene. The collisions occurred in La Jolla, Carmel Valley and Imperial Beach. At around 1:30 a.m. Thursday, an SUV veered into the wrong lane and smashed head-on into a Camry on Carmel Park Drive, near State Route 56. The collision left an oil spill. The driver of the Camry was taken to Scripps La Jolla Hospital. His injuries were not considered life-threatening, San Diego police said. The SUV's driver fled the scene on foot. Officers scoured the neighborhood by ground and air but had not located him as of 6 a.m. Police reportedly identified the SUV’s registered owner and went to his address. The owner allegedly told officers that his son was using the vehicle and does not live with him. 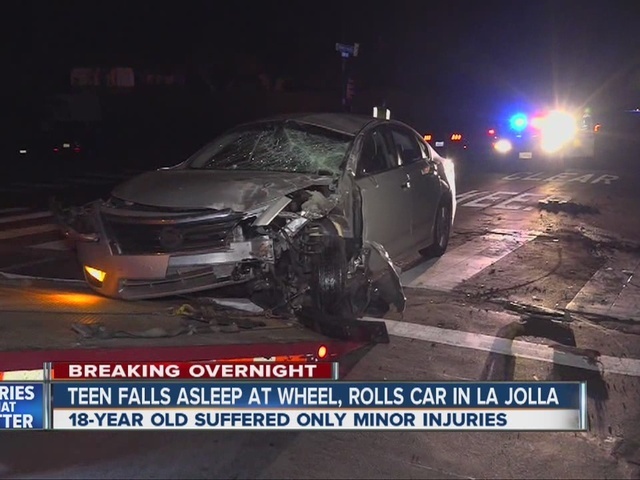 At 11:30 p.m. Wednesday, about two hours prior to the Carmel Valley crash, an 18-year-old man fell asleep at the wheel of his car in La Jolla, sheered a power pole and rolled his car. The crash occurred on Torrey Pines Road, near Ivanhoe Avenue East. The collision caused a brief outage to the immediate area. The teen was not seriously hurt. Police said he was not under the influence of drugs or alcohol. He was not cited. Meanwhile, just before 11 p.m., a man slammed his car into five parked vehicles in Imperial Beach, pushing one of them into a bedroom at an apartment complex at 870 13th Street. No one was in the bedroom at the time and there were no injuries. San Diego County Sheriff’s deputies questioned the man, who resides at the complex, and then released him without pressing charges. He told them he was driving his stepfather's car when he put it in reverse and then lost control. He did not have insurance.